This story from This is Plymouth - and therefore The Evening Herald, has attracted no less than 67 comments as I type this up. Its amazing how a fairly low key, minor story can attract so much interest, and looking at some of the comments, such rubbish too! "it is not a case of not giving youngsters a chance, but as I said, most City Buses are full to capacity in rush hour and I think this is too much for him at this age and I am quite entitled to express my concerns and worries. Yes, he may have passed the exams but that doesn't give him the working experience. Do you travel to work by bus in rush hour, I suspect not!" "He's an inspiration to us all" Please!!!!!! No wonder Plymouth is the laughing stock of the country, if this is classed as a great achievement. What with "Face of Plymouth" and the "First Teenage Bus Driver", its all getting a bit too exciting for me down here, I'll have to go back to the smoke! Will we get cheap fares when he's driving then? I rarely bother to look at the This is Plymouth web site these days, especially as since the last revamp its really hard to keep up to date with local news - which is surely the whole point of the site. The indexing is rubbish with old stories coming up on the first pages so its possible to miss stories on lower pages. When you do find stories of interest you then get the joy of the comments. Anyone who has visited my own Penguin Food Blog will know I am no stranger to expressing strong views, many of which seem to go against the general trends but I think I am normal compared to some of the 'public' out there on the This is Plymouth site! Well done to Aidan for passing and to Citybus for giving him the chance and getting him through the course. What really pees you off with these muppetts on the Herald web site is that Plymouth Citybus and probably every other bus operator in the country has been employing 18 year olds for years. 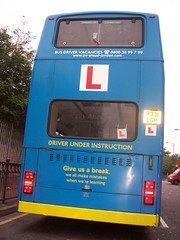 The law allows for 18 year old to drive buses but does put some restrictions on them. They cannot drive private hire work or any contract or express work outside of a 31 mile radius of their home depot. So no National Express or Megabus, no tours or excursions until they reach 21. Perfectly sensible restrictions. To be honest the Herald web site is a complete waste of internet space and the paper itself isn't much better - they even publish the stupid web site comments in the paper.